If a shaman bent down over a nepcetaq, it was said, the mask would rise from the floor and stick to his face. 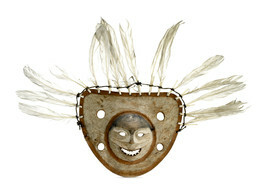 These and other dancing masks were worn during Kelek, a winter festival held in the communal house to invite, honor, and feed the spirits of game animals. The purpose was to ask the spirits to return in spring and to give their bodies to the hunters. Masks portrayed animals, animal spirits (yuit, or “inner persons”) or tuunrat (helping spirits) that assisted the shaman in his communications with other worlds. John Phillip, Sr.: Amllerqunek wii kegginaqunek tangellrunritua. Makunek kegginaqunek tangellrunritua ava-i taugaam atauciq augna murilkelluku tangvakalqa Apa’rpagmek pilallrat. Mamterillerni uitatullruuq. Kegguterluni-llu. John Phillip, Sr.: Seal-aruarungatuq. Quyuarautelliniakut uum-w’ una. Neva Rivers: A friendly one. Virginia Minock: Canqellruyaqelliniluni maa-i. Tang. Pagaani-ll’ pingqerngatuq melqunek nasqurrani. Munallruuq. John Phillip, Sr.: Piciatun-wa tua-i pilaqait makut nissunek makut yaqulet piitneng pililaqkait. Joan Hamilton: Ii-i [yes]. They drilled some holes in for other things there, and they’re missing. They usually used bird feathers attached to them like these. John Phillip, Sr.: Caneng makut kangum tua-r maa-i, kangum tua-r’ makut yaqruit. Neva Rivers: Yes. Man’ akallauguq man’a muragaq. Joan Hamilton: Qaill tau atellruagu? Joan Hamilton: Ii-i [yes]. There’s a string probably, from here (sides of mask). John Phillip, Sr.: Kegginaquq [mask]. Neva Rivers: Nunalgutaata taugaam nallunriciiqaa. John Phillip, Sr.: Piliaqestaita tau-w’ taugaam makut nalqigcugngalaqiit. Virginia Minock: Angalkurtauniluku qanrutektullrukait makut. Joan Hamilton: They don’t know what story is associated with this or dance associated with this. They wouldn’t know. Only the angalkuq [shaman] would know the stories or people who danced it. Neva Rivers: Kegginaqut, makut taugam maa-i only ataucirqumeng alrakumeng aturluki. Qelkevkenaki-llu aturraarluki unuaquani eleggluki maqikluki. Virginia Minock: Ayautetullruit-gguq nunamni yuilqumun agarrluki-llu makut. Joan Hamilton: Waten niitellruunga Mamterillermi-gguq mikelngurmun cikiuteklallruit aquitekluki-llu-gguq. Alingnaqva-g’! Virginia Minock: Inerquutnguluni taugken wangkutnun. Angalkuum pia aquitekesqevkenaku cali picirtaagutkesqevkenaku enelauciitekesqevkenaku-llu alingnaqniluki tamakut wani. Tua-i-w’ yuumcimtenun tutlarniluki. (It was prohibited for us though. We were instructed not to play with them or make fun of them because they were dangerous. Joan Hamilton: These are the workings of the angalkuq [shaman], and they’re to be respected and revered and treated very carefully. Joan Hamilton: They [at Virginia’s village] have trees and mountains, so they just hang them out there. And with us, it was burn them. Virginia Minock: [Hang them] as far away from the village as possible. Neva Rivers: Tegumiat-ll’ augkut aturpegnaki yuraraqluta with bare hands, kegginaquaqata taugaam taukut. Nutaan apernarianka angalkut taugaam ivarutaitneng aturaqameng tamakut nutaan tegumiat-ll’ imkut boys-at aturluki. Aturairluku un’ keggaacesseng angutet, kegginaqurluteng, nutaan-llu tamakut aturluki feather-alriit tava-ll’. (We didn’t use those dance fans, we danced with bare hands, except for when they dance with those masks. Joan Hamilton: Those men’s dance fans. Neva Rivers: They used the same nassqurrun [headdress], the same necklaces. Naquggluteng [they put on a belt]. That’s the time naquggcaaqluteng [they put belt on], because they’ll dance very hard in that one spot. Angalkut evaruciaritneng atuqatarluteng. Negiliteng-llu makut augarluki. Maaggun makunun qaspernun light-alriamun elliluki nutaan. Anglkuut ivarutaitneng aturluteng. Kegginaquraqameng taugaam tauna atuluku. Kegginaqut-llu cali makut pilituluki. Taum cali nalliini cali kegginaqut once a year atutuluuki. Joan Hamilton: There was a ceremony once a year where the shaman directed them on how to make the mask, and he composed the songs. They learned the songs, then they got together and they practiced the movements. And then angalquum-qaa assikaqamiu waten piniartuq nutaan tauna [the shaman liked he would say, “Now that is it”]. Neva Rivers: Nutaan tauna arulaciiraa nallaruutuq to his song. Joan Hamilton: The angakuq [shaman] would see somebody’s movement for a particular word and he would say, “Yes, finally, that’s the one I want to use to depict this word.” And that’s how they used these and for the masks and for the dance fans. John Phillip, Sr.: Uksuarmi wani Qaariitaarnilartut. Taum nallini kegginaqurluteng wani Qaariitaarluteng agayuliluteng-gguq. Nunamteni tuaten pilallruut. Augutun ava-i taruyamaurucirluteng yuratullruut augkut uksuarmi. Apeqmegnek Qaariitaam nallini kegginaqurluteng-wa qaralirluki. Makut maa-i kegginaqut wiinga meaning-aarit tuaten taum kegginaqum uksuarmi Qaariitaami atulallruit wiinga nutaan tua-i tuani tangvallruunga wii Qaariitaam nallini. (In the fall they had Qaariitaaq [old-time festival with masks]. At Qaariitaaq they used masks and prayed. That is what they did in my village. Tua-i tamakulek yurarluteng cani. Augutun qanemcinguarluteng, calinguarluteng pilallruut. Augna tangvalqa tangvallruaqa tua-i tuaten. Makut maa-i kegginaqut piciatun aturyaraunrilnganateng wangni tuaten qanrutkanka wii wani-wa. Neva Rivers: Augukut taugaam wii pillrenka kegginaqussuutnguut. John Phillip, Sr.: Yurapiaraqameng kegginaquurnek atuurpeknateng yuratullruut yurapiarluteng. Taugaam augumek apqemegnek agayuaqameng kegginaqirluteng pitullruut. Tuacetun tua-i augkunek-llu tua-i nutaan taruyamaarutnek aturluteng canguarluteng augutun qanemcirpetun yuralaucirpetun. Tuacetun tua-i tamana wii nallunrilucimcetun wani-wa. Wangkuta-llu tua augutun qanlerpetun missionary-put tekitellermegni tauten tamana assiikevkenaku tua-i taqevkarluki. Tua-i tamaa-i tamana nallunritaaqa wiinga yuraryarallrat maligutlallruama atauciirqunrilngurmeng curukalrianun. Nasqurruutet-ll augkut nasqurrutnek aturluteng yuralriit yuratullruameng tamani-w’ tua-i yuraraqaata. (I know it is done that way. Like you have said when our missionaries came they didn’t like that and made us quit. I know that way of dance because more than once I went to Curukaq [village-to-village gift-exchange dance]. They used headdresses when they danced at that time. Ici-w’ tua-i qanrucimallaruama “Murilkelluten yuukina.” Tamaa-i tamakut tuaten wii nallunritanka wii. Tua kita taqellratek ayagluku, ayagayaurrlua taqellruut. Nangnermek yurallratni nunalgutenka ilagallrunritanka tuntunun ayallruama kasmelrianun maligullua. Neva Rivers: Uksuarmi ayagluteng yuratullruut Hooper Bay-rmiut. John Phillip, Sr.: Taugaam tuaten piaqameng practice-aalartut tamakut yuarutkateng atuurqamegteki. Neva Rivers: Yes, October. Kegginaqut [masks]. John Phillip, Sr.: Practice-aarturaqluteng taukut curukat pinatkaatni. Neva Rivers: Makut-ll avatiini yurat amlleret nakaciuryarat, canun pilriit amllerrluteng yurat. Joan Hamilton: My mom says nowadays when you Eskimo dance, you’re just playing, pretending. And you’re thinking about entertainment and just fun. Neva Rivers: Unitellruyaqerput. In the year of 1946, alaillruuq. Unitellruyaqerput missionary-t’ tekicameng tamakut wipe it out. Tamana-llu pirraarluku perrirraarluku tamana qanelteng maliggluku angalkut ivarutait peggluki. Yurat-llu tamalkuita peggtevkarluki. Joan Hamilton: Missionaries wiped out the special songs that shamans composed. Neva Rivers: Ukvekluku-llu tamakut uyamiteng-ll’ imkuteng uya. Angalkut cikiutellri teguluki eggluki. Joan Hamilton: And their necklaces, they ones they were given by angalkut [shamans], they threw them away. Neva Rivers: Angalkut cali cikiutellrit makunun yungcaramegnun. Tavani angalkum tuunritlermegnun. Joan Hamilton: When they were healing somebody. Neva Rivers: Cikirluku tamakut cikiutait-llu tapeqluki avurluki egtevkalqait. Cassuukaraat tamalkuita angalkuum cikiutai. Joan Hamilton: When an angakluq [shaman] was healing, he would sometimes present a patient with something. But then after the missionaries came, they had to throw out all those things associated with angalkuq. Neva Rivers: A lot of those were charms from the angalkuq [shaman]. Pikiutait tamakut iinruit-llu [what belonged to them even their charms/amulets]. Joan Hamilton: And their medicines. Neva Rivers: Kegginaqucuarneng cikirluku tauna qelkesqelluku. Tamakuneng angalkuum iinrukiutiineng, like a little idol. Tua-w’ tauna ukvekluku pikesqelluku uyamikluku, qemagtaaqluku. That’s that little part of it what I heard from papa, mama, grandma. Joan Hamilton: The angalkuq [shaman], when he or she was conducting some kind of a ceremony, whether it be healing or something else, they would give them a physical representation of whatever he was doing. It could be a little figurine of an animal, it could be a little mask, it could be pretty much anything. He or she gave it to that patient and said, “This is your kinguan.” How would you interpret kinguan? Virginia Minock: Like a medicine. Neva Rivers: Tamakut tamaa-i taum angaklum piliallri tamakut tamalkuita teguluki egtelqait. Maa-i-llu kinguakun alaircamegteggu in the year of 1946 tegulqaat tauna. Aatama program-akun antelqaa, Christmas program-aqluku ukunun Atsaruar, Anganaran, Amlliralria, Caniman, Allailngurmun-llu. Aatamneng cauyarcirluteng. My papa was the one who made a song from the shaman song, and he told them, “This is how we used to play.” And then he made a motion [dance] out of it, and he taught the ones he chose only for a Christmas program that would be only that year. This was only an imitation of telling them how they use it, that year. And he chose Lois Tall, Catherine Bell and my sister, Helen Smith. And Julius Green was the only man that was chosen to be in that. It was supposed to have another two boys, but he chose only Julius Green. And it was just shown only once for an audience, along with our Christmas program. Kiiremi elliin aturpagluku nallunrilamiu [he was the only singer because he knew it], because he practiced all those [songs]. Tamaken ayakarluku-llu tamaken nutaan wangkuta Christmas program aturyaurtarput, Christmas, Easter-aami-llu. Kelegluki-llu tavani, three times in a year. Tamakut kelegluki from Scammon Bay, Chevak, Hooper Bay, together. Taum-ell kinguakun cimirtuq kinguakun. Augkut angalkut ivarutellriit-llu-gguq peggluki-gguq wangkut-ggun pililuki. Kenkestengqenritliniamta-yam peggluki tamakut maa-i, tengsuutmeng tekitellriameng, but the air will be same, but the words will be changed. Makut-ggun nutarat-ggun piluteng. Pinguarluta tua pinguarraarluta, just like your mama said. (It has changed after that time. They got rid of all the songs of the shaman, got rid of them through us. Because there are people who do not like us they got rid of those ways, like today there are planes that arrive, but the air will be same, but the words will be changed. They are going by the new ways. Joan Hamilton: Because those four people knew how to dance and they have some familiarity with the way they were done before, they were picked. One of them was my mother, one of the dancers. Normally there’d be more men, but her father only picked Mr. Green, one male. And it was to show the kind of songs the angalkuq [shaman] composed and made. But then after that, now what you see nowadays is for entertainment. It’s pinguaq [fake]. Just for the Christmas program. Neva Rivers: Everybody likes it. 1. From discussion of headdress E127329. 2. A qaspeq is a “thin hooded garment, usually of cloth, worn as a parka cover, as a jacket or dress;” also spelled (Anglicized) kuspuk (Jacobson 1984). 3. From discussion of headdress E127329. 4. Qaariitaaq is “an old-time festival held in late October” with “masked participants;” and “although this festival predates contact with Europeans, the name has been adopted for Halloween” or “October” (Jacobson 1984). Qaariitaaq is also described as “a ceremony in the fall after freeze-up when children with painted faces visit house-to-house receiving food and water” (Fienup-Riordan 2005). 5. A Yurapiaq—which literally translates as “real dance”—is a “long story dance performed by women (Fienup-Rirodan 1996). Yuraq is “Eskimo dance; a dance in the traditional Eskimo style” (Jacobson 1984). Yuraq is also defined as a “generic term for Yup’ik dancing” and “is used to distinguish arula dances, consisting of both verses and a chorus” (Fienup-Riordan 1996). 6. Agayuyaraq means “way of making prayer; dancing with masks requesting abundance in the coming season, held in late February or early March” (Fienup-Riordan 2005). 7. Curukaq is a “feast wherein one village goes over to another to dance and exchange gifts or challenges (athletic, dance, gift-giving, etc. )” (Jacobson 1984). It is also called Kevgiryaraq (Fienup-Rirodan). 8. Nakaciuryaraq is a “bladder feast, a traditional celebration involving the ceremonial use of inflated sea-mammal bladders (Jacobson 1984). It is also called a “Bladder Festival, in which bladders of caribou and seal are sent on a journey under the ice to return the following season; held in late fall” (Fienup-Rirodan 2005). 9. From discussion of headdress E127329. 10. From discussion of headdress E127329. 11. An iinruq or iinru—singular form of iinrut—is traditionally an “amulet, charm” and is the contemporary word for “medicine, aspirin, pill” (Jacobson 1984). 12. From discussion of headdress E127329. Masks often portrayed animals, their spirits (yuit or inner “persons”), or sometimes tuunrat [helping spirits] who assisted the shaman in his communications with the spirit world. (6) Some tuunrat, it was believed, held animal yuit in the sky world until the shaman flew to the moon to release them. (7) Songs, masks, and dancing—all composed and directed by the shamans—brought these stories and spiritual beings to life in the qasgiq.